Storify is likely the most versatile tool to collect disparate web content that you can weave in a stand alone collection. You can easily log into storify with your twitter login. The storify process includes using the tools on the right to find content from many social media services, or directly if you know the URL of the item you wish include. Once added to the vertical timeline on the left, you can re-arrange the order, and you can add text commentary or explanation wrapped around any item. 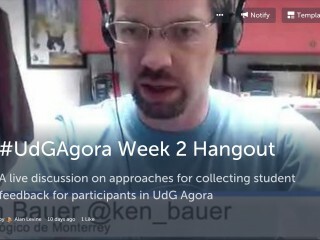 #UdGAgora Week 2 Hangout include not only the video archive, but tweets sent during the hangout, and other related links. Storify can be a tool that students use to synthesize information and media they find online, to make their own portfolios (best work), or to create collections of references. Storyboards: flipping storify and the classroom (Sheila MacNeill) – how nursing classes are using storify to create content for students to view in a flipped classroom model. This is storify summary of the UDG Agota Week 5 Google Hangout… where Alan Levine was demonstrating how to use this tool.